An uninhabited island with a regal history is set to change hands before Christmas in a deal to the tune of GBP 500,000. Located in Scotland’s Outer Hebrides region, Wiay Island formed a hideaway for Scottish monarch Bonnie Prince Charlie, who was sought by British forces following a significant defeat during the Jacobite Rebellion in 1746. Located just half a mile to the south of publically-owned Benbecula Island, Wiay is accessible only by private boat, making this island one of Scotland’s most secluded retreats. An offer has already been accepted by selling agents Bell Ingram, who, providing all goes to plan, expect that the deal will close by the end of this week. Despite attracting a series of overseas bidders, it was a local buyer who prevailed, placing an offer in excess of the GBP 500,000 asking price to secure this historical Scottish island. According to a spokesperson from the selling agents Bell Ingram, the deal is set to be concluded in the coming days, with the island set to exchange hands just in time for Christmas. 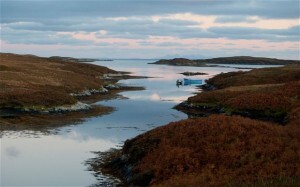 Aside from occasional campers, the 970 acre island has stood uninhabited for over a century now and it’s only building – a crofter’s cottage – has since fallen into disrepair. Changes are afoot, however, with planning permission already in place to develop the croft into a new two-bedroom development, set to make the most of the island’s stunning surroundings. Available for less than the price of a small family home in London, the island also boasts sporting rights, with its heather clad landscape forming the perfect hunting ground for the island’s red deer, woodcock and abundance of ducks. The surrounding waters have a high stock of fish, as do Wiay’s fresh water lochs, making the island an excellent choice for keen anglers and huntsmen.